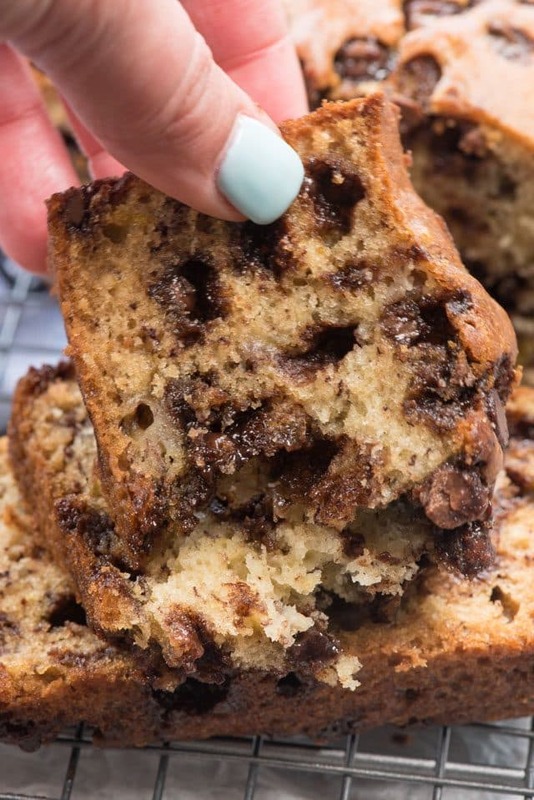 Chocolate Chip Banana Bread is a delicious breakfast recipe everyone loves! My mom’s banana bread recipe is filled with chocolate chips for the breakfast your kids will want to eat. If I had to pick one breakfast indulgence I can’t get enough of, it would be banana bread. I’ve loved this warm and gooey bread since I was a little girl when my mom would make her banana bread on Saturday mornings. We’d all crowd into the kitchen barely waiting for the bread to cool before we attacked it with butter that would melt and drip because the bread was still hot from the oven. There’s nothing more nostalgic than that, is there? Every fall I start thinking more and more about making banana bread almost weekly. It seems counterintuitive, but I crave a slice of banana bread with a nice hot cup of coffee after I work out. I wish I could indulge that craving more often, but when I do I forget about calories and carbs and I eat a slice of delicious banana bread, even better when it has chocolate chips. I’ve turned my mom’s banana bread into so many other flavors: triple chocolate banana bread, cinnamon pecan banana bread, even pumpkin spice! It’s so simple to change around your favorite recipe to make a banana bread everyone loves. The most simple (and best way) to change up my mom’s banana bread? With chocolate chips, of course. 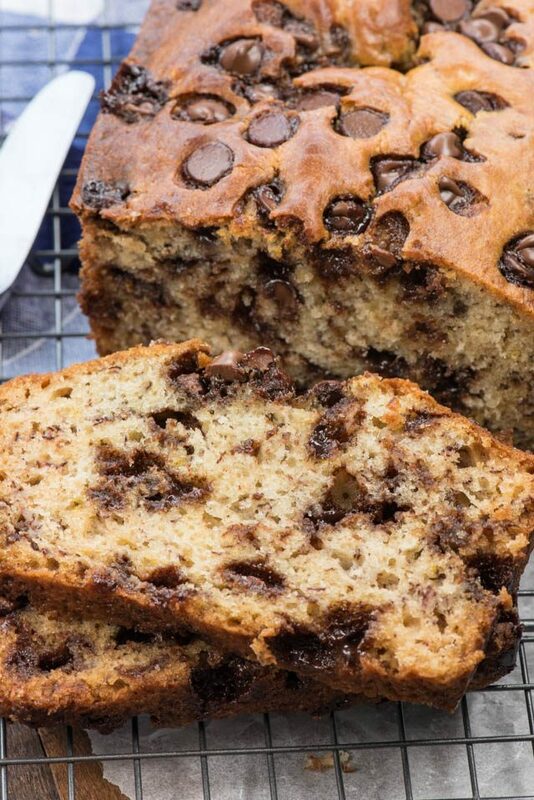 Chocolate Chip Banana Bread is a heavenly quick bread recipe full or banana flavor and rich chocolate chips. Everyone loves chocolate for breakfast! Let’s talk a little bit about banana bread science, because my mom’s recipe is really the best one out there. 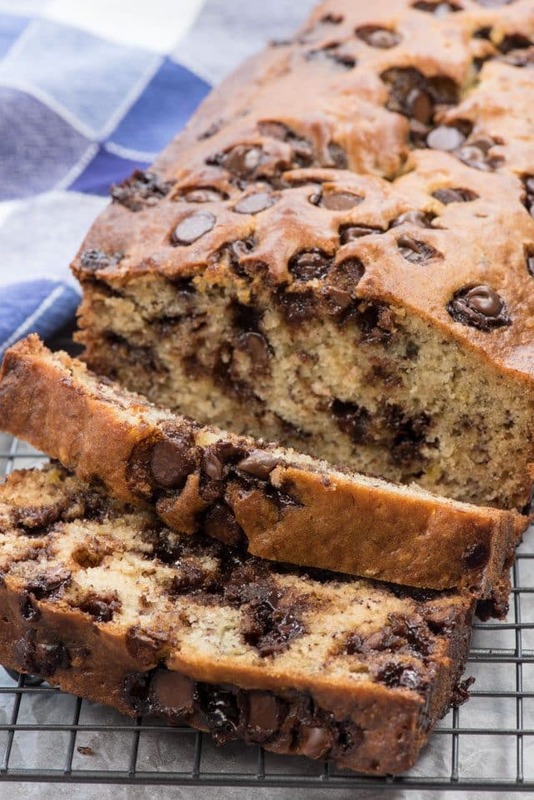 This chocolate chip banana bread is easy to make and has a wonderful banana flavor. It’s made with 2 bananas and you can use oil or butter. I love making it the way mom did – with lots of butter! Bananas – the most important part. Use overripe (or “tired”) bananas. They have lots of brown spots. Fat – butter or oil. I love using unsalted butter, but you can also use equal parts vegetable oil or liquid coconut oil. Sugar – I use granulated sugar in all my banana bread recipes. Milk – some banana bread recipes use sour cream but I use sour milk. My mom’s recipe calls for sour milk (aka Buttermilk), and if you don’t have buttermilk, it’s easy to make your own. Just mix 1 teaspoon vinegar or lemon juice into the milk and let it sit for 5 minutes. Voila! Buttermilk! Baking soda – this recipe uses baking soda instead of baking powder. The acid in the sour milk or buttermilk helps to activate the baking soda causing a nice rise in the loaf. Chocolate! Use your favorite kind of chocolate chips in this recipe. How do you make chocolate chip banana bread moist? Banana bread stays moist mostly because of the bananas. But the sourness from the buttermilk and the fat also helps keep it moist. It will stay that way for a few days, if it lasts that long. Did you know you can freeze your overripe bananas? I always tend to over buy bananas and they go brown before I eat them. I always freeze them so I can make banana bread whenever I want. Another thing I love about this chocolate chip banana bread is that you can make it in muffins too. Banana Bread Muffins are some of my favorite things to pack in my daughter’s lunch. 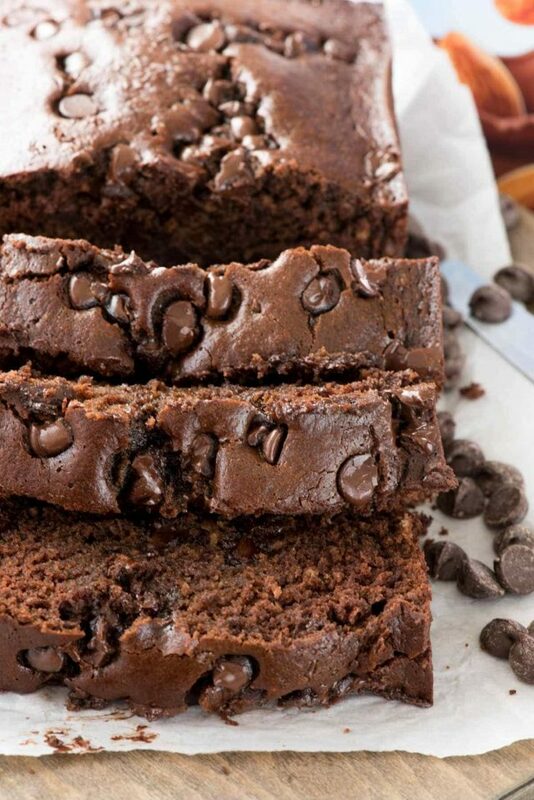 With chocolate chips – even better! 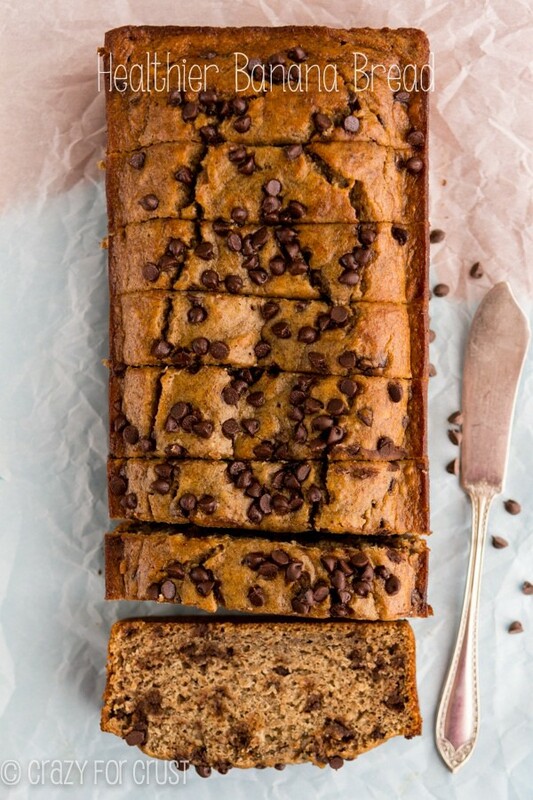 You can even take this chocolate chip banana bread recipe and make it healthier – I’ve done that too. However you make your banana bread, don’t forget chocolate chips. They complete the recipe! I recommend using a 9×5 baking pan for this bread, or muffins. You can also make 3 mini loaves. You can substitute soy or almond milk in this bread, but add 1 teaspoon of vinegar so the baking soda is activated. It will brown a lot on the outside while it’s baking. If it’s browning too much, reduce the oven temperature by 25°. It will form a nice crack on top. Once a toothpick comes out mostly clean right outside the crack, the bread is done. Let it cool a bit before slicing or the chocolate chips will create holes in the bread. This also freezes well! Check out my post on how I freeze desserts – and quick breads too! 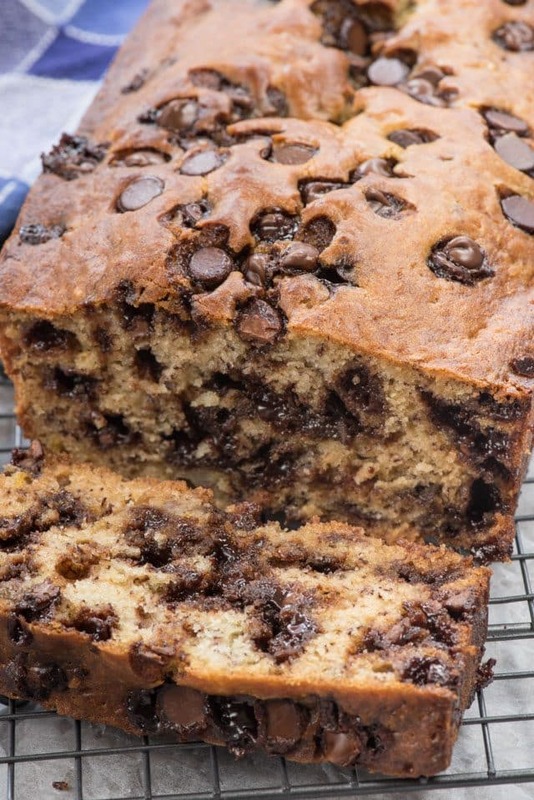 Chocolate Chip Banana Bread is a delicious breakfast recipe everyone loves! My mom's banana bread recipe is filled with chocolate chips for the breakfast your kids will want to eat. Preheat oven to 350°. Spray a 9x5 or 8x4 loaf pan with nonstick cooking spray. Cream butter and sugar in the bowl of an electric mixer (and hand mixer is okay too). Add the bananas, eggs, sour milk, and baking soda to a blender. Mix until liquefied. Pour half of the banana mixture into the butter mixture with 1 cup of flour and mix until just combined. Repeat with the rest of the liquid and flour. Do not overmix! Pour into prepared pan. Sprinkle with remaining chocolate chips. Bake approximately 50-60 minutes or until a toothpick comes out mostly clean (test right next to the crack). Cool at least 10 minutes in pan. This also makes 12 muffins (bake time approximately 15 minutes). You can substitute equal amount vegetable oil for the butter. You can substitute equal amount soy or almond milk for the milk, just add 1 teaspoon vinegar to the blender to activate the baking soda. Don't have a blender? You can make this by hand as well; just mash the banana with a fork. Triple CHOCOLATE Banana Bread is also a great recipe. This is a HEALTHIER Banana Bread recipe. Banana Bread Muffins are another favorite breakfast. Now I’m going to have to make a loaf for myself… YUM! We love chocolate chip banana bread in our house. When we’re down to 2 bananas, the kids won’t eat them because they always want me to make chocolate chip banana bread with them. Could I use buttermilk ? Hey, We love chocolate chip banana bread in our house. Especially I have to do it for my kids. They are mad on this. The kids always want me to make chocolate chip banana bread with them. Got this chocolate chip banana bread in the oven right now! Smells delish!